I have decided that the best way to give life back to a long neglected blog is to join in on a blog hop with twenty four other Stampin' Up! demonstrators from Australia and New Zealand. The 'ESAD Blog Hop' is a way to show off lots of different ideas and projects from the fabulous new 2014-2015 Stampin' Up! Annual Catalogue and I am super excited to be involved. We love what we do & love to share with our customers, friends and blog visitors. We also share what we love in our ESAD Demonstrator community, through swaps, challenges, sharing knowledge, ideas & friendship and we're always there to help and support each other. Whether you have arrived at my page from Christie Kunkel's blog or you are starting your journey here on my page THANK YOU for popping by and I hope you enjoy what the 24 of us have created to inspire you. For my blog hop project, and first creation posted on my blog for a very long time, I have created a pretty frame to decorate my craft room. This project is a hybrid of digital and handmade work and includes a brand new My Digital Studio download from the new catalogue, as well as the beautiful 2013-2015 In-Colours. The idea for my project came from wanting a pretty way to remind myself on a daily basis to think positive and be thankful. I absolutely love My Digital Studio and how simple and easy it makes it to design beautiful digital work. A quick flick through the catalogue and I found the perfect MDS download to use for my project. 'Grateful Hearts Framables' has some really beautiful quotes that can be used for all sorts of creations, from cards through to large home decor items. 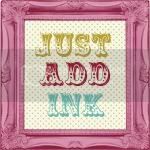 An easy download into MDS and some colouring in of the image in my chosen Stampin' Up! colours (Strawberry Slush; Pool Party; Coastal Cabana; Crisp Cantaloupe) and I had the perfect inspirational centrepiece for my frame. Next step was to print my quote out on my home printer and then back that onto some Pool Party card. The base paper for my frame is some Crisp Cantaloupe designer series paper from the 2013-2015 In-Colour Designer Series Paper Stack. The Spiral Flower Die has to be one of my most favourite products that Stampin' Up! has released lately. Using the Big Shot, this die and some of my favourite coordinating colours of cardstock, a bit of spritzing and a bit of rolling and waah-laaah I was able to create some beautiful roses. The little leaves under the roses are made from the Bird Builder Punch. Add a doilly, some pretty little Designer Series Paper Bitty Butterfly punched flutterflies, and some pearls and there you have my framed artwork which will remind me each time I look at it to be thankful for all the wonderful things I have in my life. I really hope you like what I have made today and that it may inspire you to make something pretty for your own home and to remember that 'There Is Always, Always, Always Something to be Thankful For'. 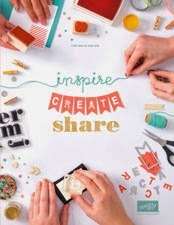 blog and check out what she has created from the gorgeous new catalogue. Here is a list of the other blog hop participants too. Just click on their names for a link to their blog. 14. Louise Layton ------ That's ME! Thanks so much for joining in the blog hop Louise. 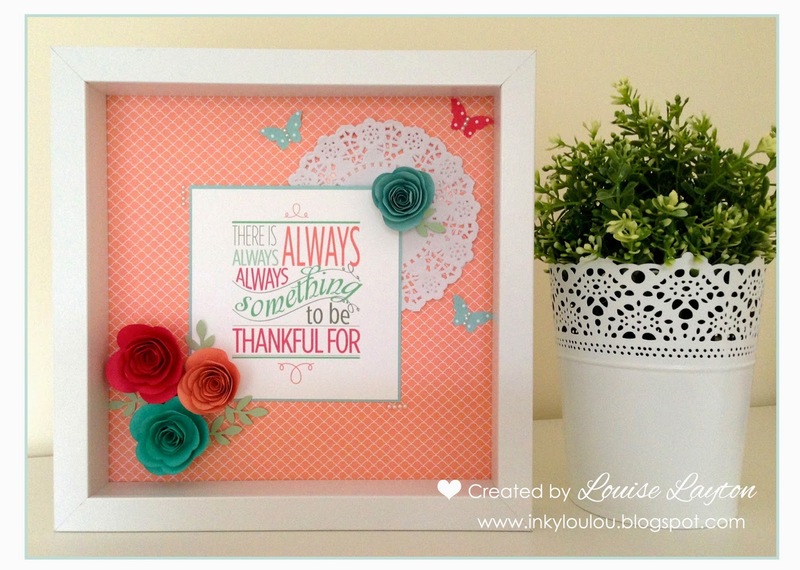 The colours you've chosen for your shadow box are beautiful as is your quote. Stunning!!! Love it. I haven't really gotten in to MDS, must try and become friends with it! What a great way to get back to blogging. I too had time off and love that I am back blogging with this blog hop. Such a beautiful project. Thanks for sharing. Such a gorgeous 3D project, and a lovely quote (mental note to add that MDS download to my wishlist). Thanks for sharing. PS, your photography styling is unreal! So pretty Louise. Thanks for sharing this. Just stunning! Love the frame! Thanks for sharing! So looking forward to regular visits here.......shame about my housework!